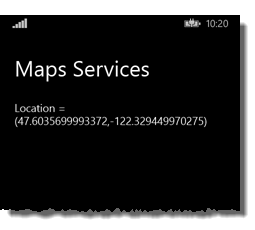 Convert addresses to geographic locations (geocoding) and convert geographic locations to addresses (reverse geocoding) by calling the methods of the MapLocationFinder class in the Windows.Services.Maps namespace. Here's how the classes for geocoding and reverse geocoding are related. The MapLocationFinder class has methods that do geocoding (FindLocationsAsync) and reverse geocoding (FindLocationsAtAsync). These methods returns a MapLocationFinderResult. The MapLocationFinderResult contains a collection of MapLocation objects. Access this collection through the Locations property of the MapLocationFinderResult. Each MapLocation object contains a MapAddress object. Access this object through the Address property of each MapLocation. At the top of your class file, add a using statement for the Windows.Services.Maps namespace for the MapLocationFinder class and the related classes. Typically you also have to have a using statement for the Windows.Devices.Geolocation namespace. The examples in this topic assume that the XAML page contains a TextBlock control named tbOutputText to display the results. Convert an address or a place name to a geographic location (geocoding) by calling one of the overloads of the FindLocationsAsync method of the MapLocationFinder class. The FindLocationsAsync method returns a MapLocationFinderResult object that contains a collection of matching MapLocation objects. Access this collection through the Locations property of the MapLocationFinderResult. // Address or business to geocode. // Nearby location to use as a query hint. // as a query hint. Return no more than 3 results. // of the first result. Convert a geographic location to an address (reverse geocoding) by calling the FindLocationsAtAsync method of the MapLocationFinder class. The FindLocationsAtAsync method returns a MapLocationFinderResult object that contains a collection of matching MapLocation objects. Access this collection through the Locations property of the MapLocationFinderResult. Each MapLocation object contains a MapAddress object. Access this object through the Address property of each MapLocation. // Location to reverse geocode. // Reverse geocode the specified geographic location. // contained in the address of the first result.